10 balls of Regia yarn in assorted colours and types, but just one ball in each colour. I was given these by my daughter. They had come into her magazine and no one in the office wanted them. I did knit a cardigan for a premature baby with one of them, you may remember this. But as one ball isn't enough for a pair of socks they have been languishing in the stash cupboard. My first hat is a free pattern from Ravelry, originally printed in Prima magazine back in July 2009. It has a pretty lacy edge. I did take a picture but its come out blurry, so you will have to make do with the one below. I love to see how these yarn knit up. I have an assortment of different patterns so we will see what we get. At least these little hats are portable and make great gifts to have on hand. Work on Purple Haze is coming along, one sleeve and half a front to do then the finishing off. Frilled dress is still in its bag and I do a few rows on the ten stitch blanket when I get bored. What a really pretty hat pattern and it will work up great in that yarn ! Such nice yarn as I have just finished a pair of socks out of 2 balls of the Regia design line. It didnt stripe though as it was a Kaffe Fassett colorway but I am sure I have some more in my stash. I will be interested to see how they all knit up in the different colors. 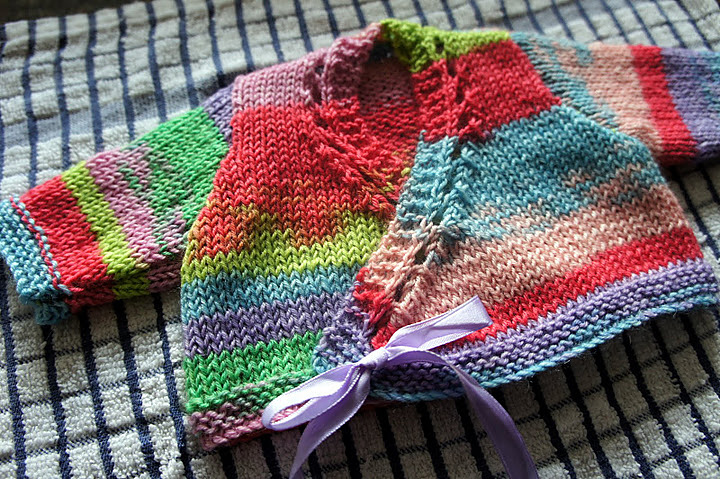 The baby cardigan is just gorgeous and the little hat is knitting up so prettily too. What a great find in your stash! Baby hats and mitts are a great idea. If you get tired of doing those you could do a pair of socks by using two different skeins and alternating them every four rows or so. It might make for a very interesting looking pair! Your daughter is the best, such a great surprise! That hat is going to be super cute. Lovely! I can't believe no one wanted them! I love Regia. Lovely wool and I love the jacket you made. Hats are always great too. Like kristieinbc I was going to suggest alternating two balls but for the mittens. A friend who spins uses up her odd lengths by making striped mittens. The range of colours in each mitten is the same but the order changes for the second mitten of the pair. The hat is looking good in the Regia but it's a pity there isn't enough of the same yarn for a pair of socks. The hat is lovely. I have that pattern too so will give it a go one day.